I think I’ve been planning to hike to Los Alamos Reservoir for a couple of years now. However, up until now, I’ve been deterred by the big orange “Closed for Construction” sign at the trail head. There have been persistent rumors, on Facebook and elsewhere, that, really, it’s okay for hikers to go up there now; the reconstruction is nearly complete, the sign is out of date, but no one has gotten around to taking it down yet. But I haven’t quite felt right about going. I mean, the sign is all big and orange and everything, y’know? Then, this week, I saw a County notice that the reservoir would be closed to hikers for the winter in a few days. Well, it stands to reason that if it’s about to be closed, it must be open now, right? So I packed up my gear and headed out. Los Alamos Reservoir is located in Los Alamos Canyon west of Omega Bridge. The area is scenic, and also geologically interesting. 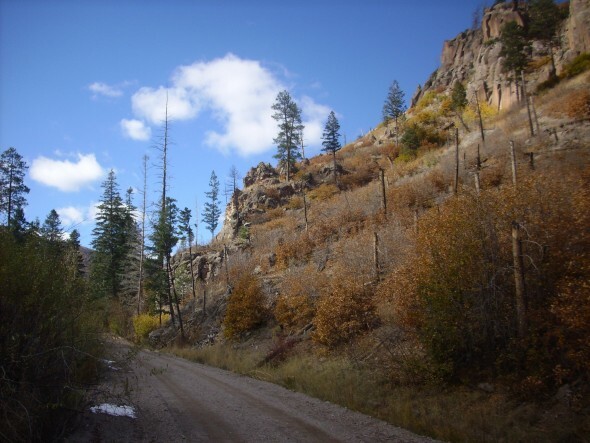 While lower Los Alamos Canyon is walled with the usual Bandelier Tuff, the underlying formations are exposed in the upper canyon, beginning just east of the reservoir. These formations include the Tschicoma Formation, which forms most of the skyline west of Los Alamos, and an older andesite bed that has the right composition and age (about 8.72 million years) to be part of the Paliza Canyon Formation that dominates the southern Jemez. I parked at the skating rink and headed down the road to the trail head. From here it was a pleasant hike on a fairly decent gravel road to the reservoir. The first part of the hike was between cliffs of Bandelier Tuff, which are very familiar to hikers in the Los Alamos area. As I approached the reservoir, I saw my first signs of the underlying formations. 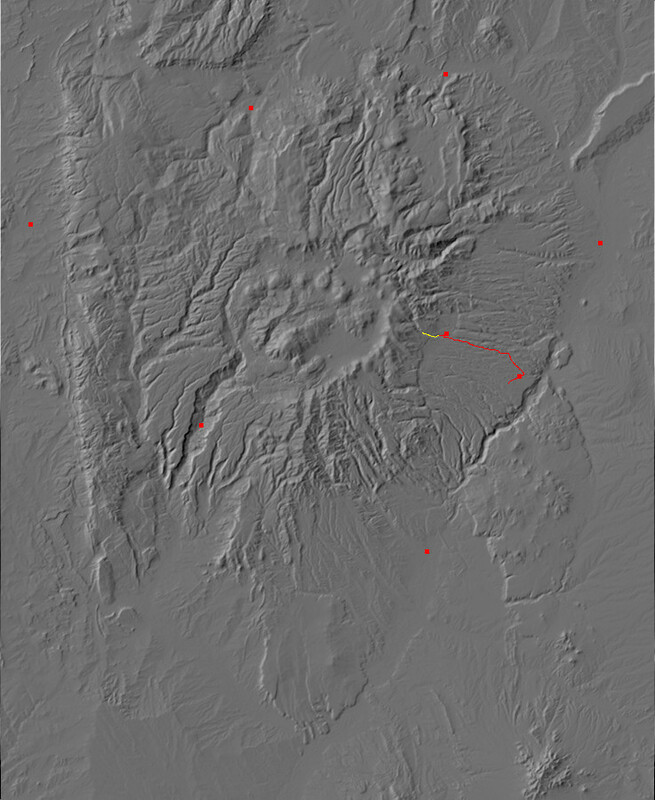 These are probably surge beds, which are common at the base of pyroclastic flows like the Bandelier Tuff. High-silica magma is extremely viscous, and it often contains a large amount of dissolved gas. So long as the magma remains below the surface, the dissolved gas is kept in solution by the weight of the overlying rock. When the magma erupts to the surface, the gas comes out of solution to turn the magma into a froth of tiny bubbles that explodes into ash and red-hot gas. This mixture of hot gas and ash is heavy enough (from the ash content) to flow along the surface like a liquid, often for miles. This is known as a pyroclastic flow. When the flow finally comes to rest, the ash settles onto the surface to form a rock called tuff. 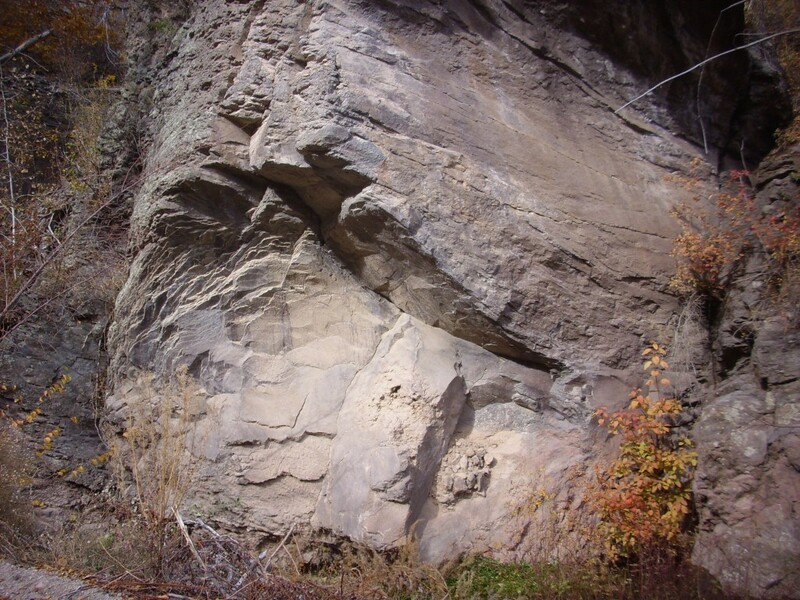 The Bandelier Tuff found at Los Alamos and much of the rest of the Jemez area records two such catastrophic eruptions, at 1.65 and 1.29 million years ago, that formed the two main layers of the Bandelier Tuff (the Otowi Member and the Tsherige Member) and created the Valles caldera. 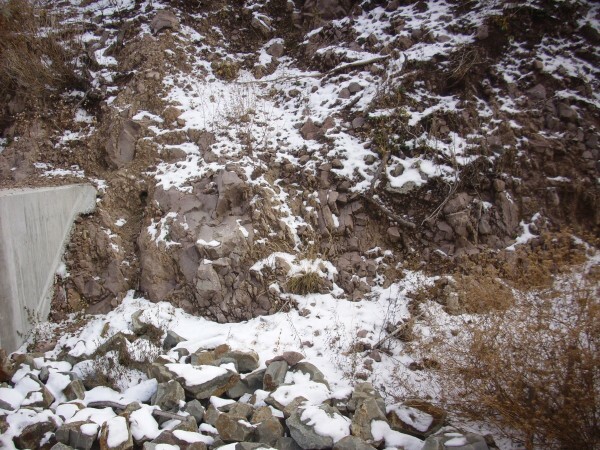 Surge beds are often found at the base or the leading edge of a pyroclastic flow. They form from a part of the flow that is particularly hot with only a moderate content of very fine ash, which leaves thin beds at the base and edge of the flow. Because this part of the flow is relatively buoyant, it can surge across low obstacles and some distance up slopes. Continuing west, I came across the first exposures of the formations beneath the Bandelier Tuff. To the upper right are pink cliffs of the Bandelier Tuff (Tsherige Member.) The rugged mass of darker rock beneath, just to the right of the road, is mapped as Pajarito Mountain Member of the Tschicoma Formation. This formed from magma slightly lower in silica than the Bandelier Tuff, and also somewhat older, at about 3 million years in age. 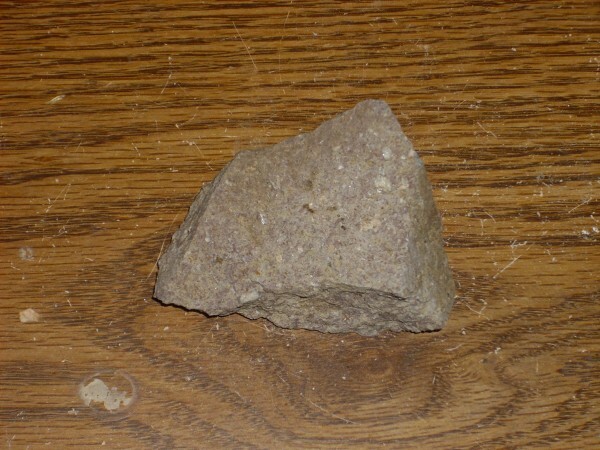 Rock of this type is called dacite, and it forms most of the skyline west of Los Alamos. 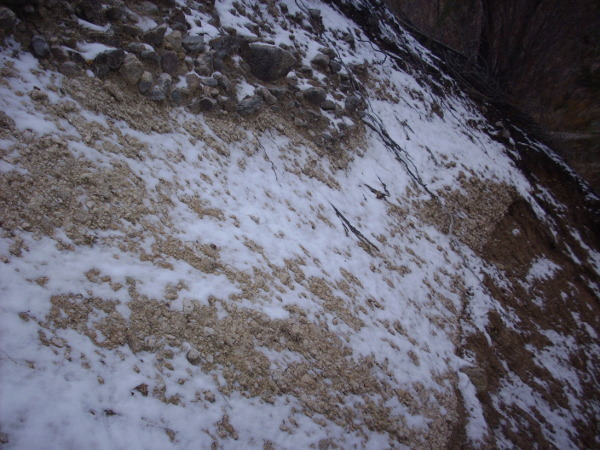 In addition to the darker color, it is distinguished from the Bandelier Tuff in being denser, harder, and showing an abundance of large white crystals of calcium-sodium feldspar, plagioclase, in a fine-grained matrix. 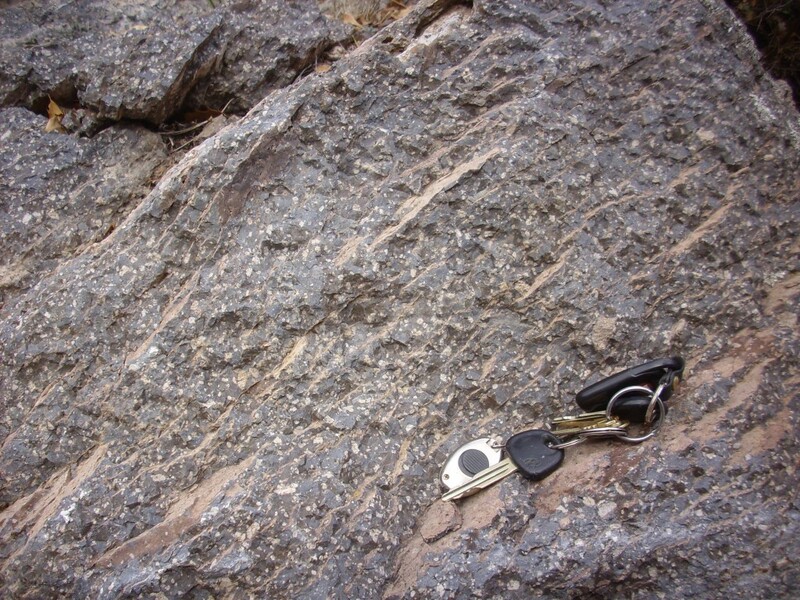 These larger crystals, called phenocrysts, are a common feature of volcanic flows formed from magma with a moderate silica content, and they generally were already present in the magma when it erupted to the surface. Here’s a closer view of the dacite. If you click to enlarge the photograph, you can make out a few of the phenocrysts. The north cliffs of the canyon around the reservoir are all Bandelier Tuff over Tschicoma dacite. If you click to enlarge, you can see that there is considerable rubble at the base of the Pajarito Mountain dacite, where it rests on an older Tschicoma flow that is mostly concealed under the foreground soil. 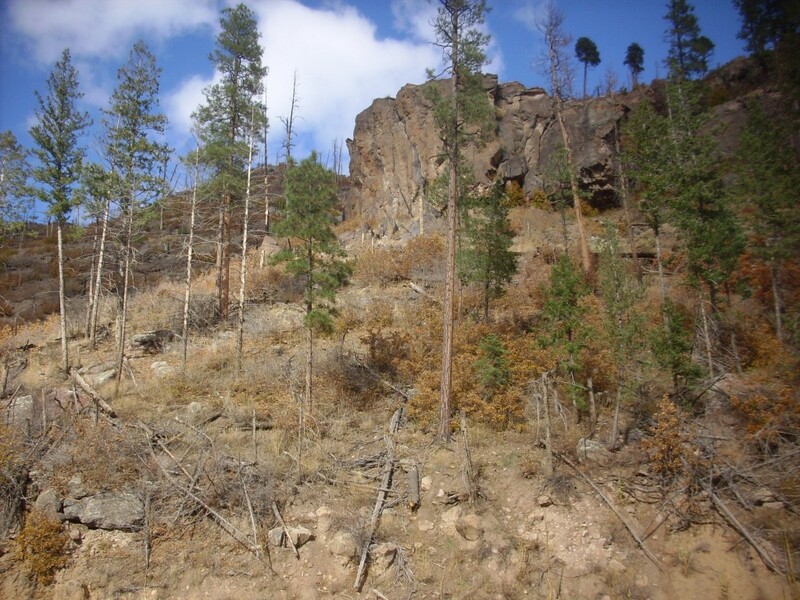 Further west, there is a prominent fault across the canyon, and to the east (right) a large block of Paliza Canyon Formation andesite has been thrown up. Or, at least, I think this is andesite. The location seems right from my geologic map. It was too much of a scramble for me to climb up and see for sure. Not far west of here, on the other side of the fault, is some really pretty Tschicoma dacite exposed in the road cut. Here’s a close up. Notice the distinctive white plagioclase phenocrysts. The reservoir was only partially full and the road was washed out west of the reservoir. After exploring the north side, I was eager to look at the south side, where there was an outcropping of what I suspected was Paliza Canyon Formation andesite buttressing the south side of the dam, and also a deep gully (probably recently eroded) down the side of the canyon that exposed some interesting-looking beds. The trick was getting to them. The south canyon wall plunged almost directly into the reservoir; there was no shore to hike along to the interesting stuff. Crossing the dam itself was out; the walkway had apparently been destroyed by floods from the recent wildfires and had not yet been reconstructed. I had to settle for scrambling across the canyon below the dam outlet and climbing back up to the level of the dam, which was awkward but doable. Here’s the andesite outcrop on the south side of the dam. From there I hiked a little further west to where the deep gully came down the canyon wall. You can see that there is a thin layer of snow on the ground, which is really too bad. It obscures the beds, and there’s a good chance the reservoir will be full enough next time I have a chance to come this way that I won’t be able to get to the gully. But you can see some interesting beds below the Bandelier Tuff at the top of the cliff. Why interesting? 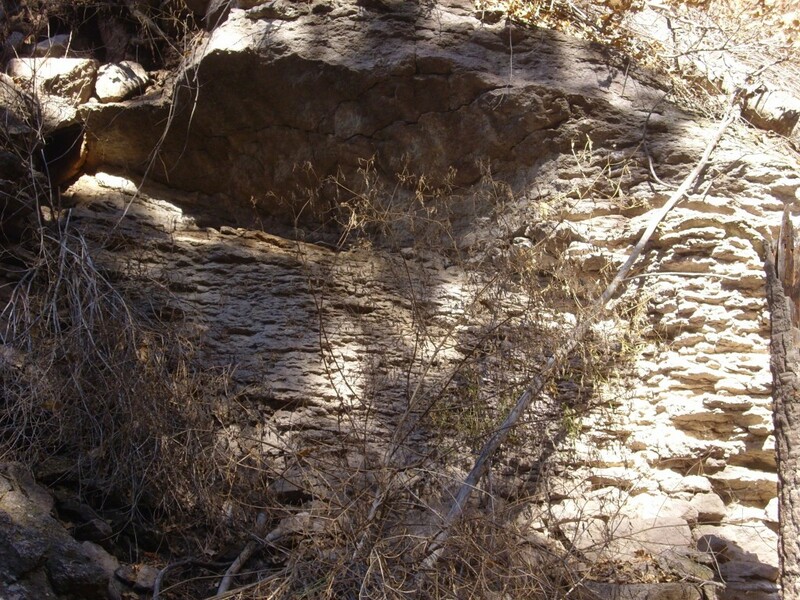 Beds of sediments are quite commonly found between the two members of the Bandelier Tuff, which, after all, were erupted almost 400,000 years apart. 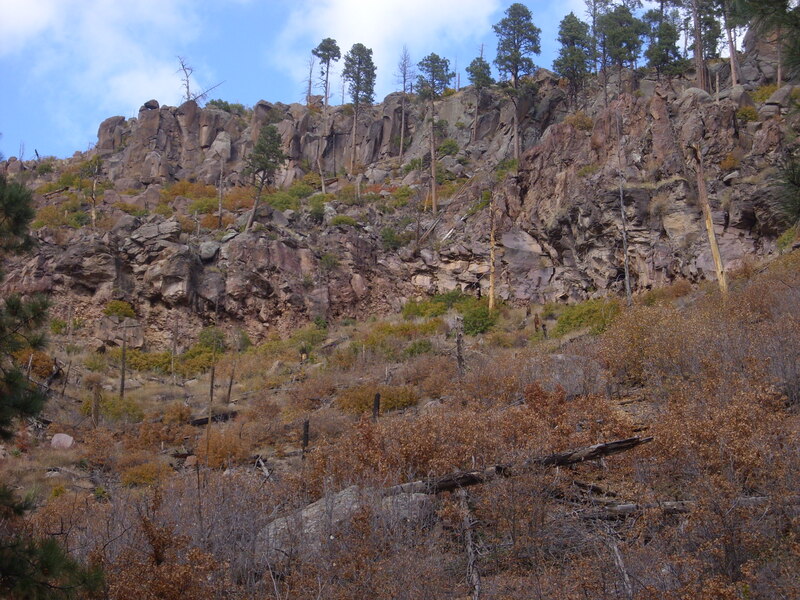 These are known as the Cerro Toledo Interval, because the sediments typically contain ash and pumice from smaller eruptions in the Cerro Toledo area of the Jemez. They’re thickest north of Los Alamos, but there is evidently some thickness here as well. Under the snow, and below the Bandelier Tuff, you see a bed of very coarse conglomerate, with boulders of Tschicoma dacite larger than a basketball. Beneath this is a thick pumice bed, then very fine sediments, all resting on Paliza Canyon Formation andesite. What’s particularly interesting about this is that the two eruptions that produce the two main members of the Bandelier Tuff both started with a pumice eruption. As a result, in most places, the lowest part of the Otowi Member is a pumice bed known as the Guaje Pumice, while the lowest part of the younger Tsherige Member is a pumice bed known as the Tsankawi Pumice. The pumice here looks like it should be the Tsankawi Pumice, but it’s separated from the rest of the Tsherige Member by this thick layer of very coarse dacite conglomerate. There is no sign of pumice between the coarse conglomerate and the Tsherige Member. It was a bit of a scramble to get this far up the gully. 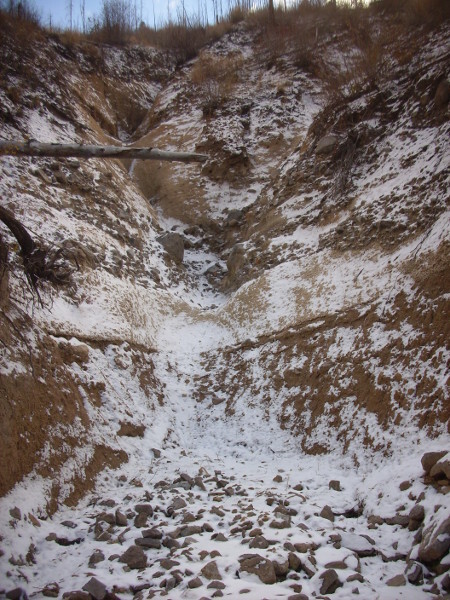 Before sliding back down, I took another photograph of the pumice and the beds immediately above and below it. You can clearly see the coarse conglomerate above and fine sediments below the pumice. There are a couple of interpretations that are plausible for this sequence of beds. The first is that the pumice is not Tsankawi pumice at all, but some other pumice eruption of the Cerro Toledo Interval. This is not terribly plausible, because this is a very thick pumice bed but is too far south for the Cerro Toledo eruptions. 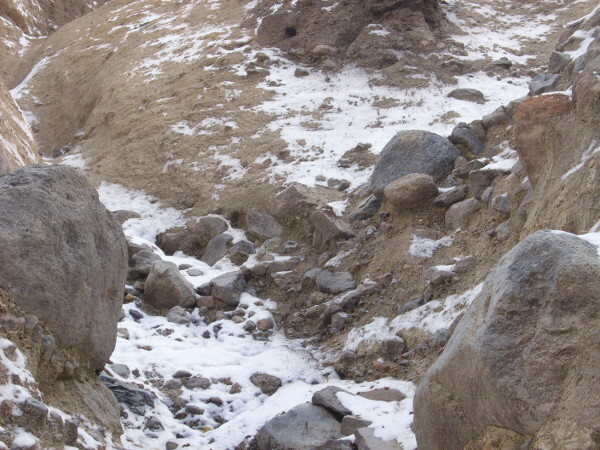 The second interpretation is that the coarse conglomerate is actually a debris flow that took place after the Tsankawi pumice fall but just before the main pyroclastic eruption that produced the Tsherige tuff. This seems more plausible and could be confirmed by analyzing a sample of the pumice to see if it matches Tsankawi pumice. Alas, I was in no position to hammer off a sample here (I was kind of clinging on to the steep gully wall for life), and I’m not really equipped to analyze petrological samples in my garage anyway. I’ll leave it as a mystery for a more professional geologist. It was getting late in the day, it was getting cold, and I had pretty much seen everything I had time to see. I retraced my steps and headed home.